When I owned a large diesel motorhome I wanted to tow my family vehicle behind it. Since I did not own a car that was flat-towable, it was cost-prohibitive and a potentially logistical nightmare to do so. I ultimately purchased a high-quality and relatively inexpensive tow dolly. It was a luxury for us to finally have our car with us on our travels and a treat not to have to tear down the RV every morning. My Prius and tow dolly together weighed only around 2,000 pounds, and therefore I literally did not notice the small amount of added weight behind the RV. The only way I could tell my car was still there was to look in my backup camera. If a tire blowout occurred on the dolly or toad it would be difficult, if not impossible, for me to recognize it from the driver’s seat or feel it in the handling. Even before I hooked up my dolly for the first time I recognized the importance of installing a tire pressure monitoring system (TPMS). A tire failure was a highly possible and even likely scenario, since my dolly utilized ten inch wheels, which is very small by towing standards. Aftermarket TPMS systems incorporate small pressure transducers that thread onto the tire valve stems, as well as a receiving unit that is programmed for each transducer. 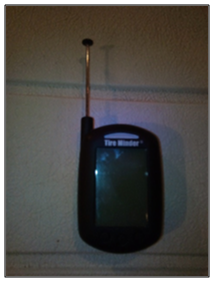 This allows the receiver, mounted near the driver, to communicate tire pressure and temperature data in real time for each sensor location. In my case, I purchased extra sensors and installed one on each tire on the RV and dolly, as well as the rear wheels of the toad. I did not need them on the front tires of my Prius, since they were off the ground on the dolly. A few years ago we were climbing the grapevine out of Los Angeles, heading north on Interstate 5. If you are not familiar with this stretch of road, it’s very long and steep. It’s one of those passes where there is a sign advising drivers to turn off their air-conditioners to avoid overheating. As we were climbing, my TPMS started to buzz. It was indicating that my right dolly tire was quickly losing pressure. Fortunately there was a pull-out there, so I was able to react quickly and stop the vehicle. Upon inspecting the dolly, it was obvious that there had been a blowout, as the tire was almost flat and had an audible leak. We carried a spare for the dolly, so were quickly on the road again. Had I not had the TPMS, it is unlikely I would have noticed the blowout in time to avoid serious damage and possible injury. It is not likely another driver would have noticed and signaled me, since the blowout occurred on the curb-side. I highly recommend a TPMS system regardless of whether you are towing or not. 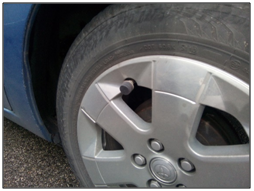 TPMS systems provide great peace-of-mind and I can certainly attest to the fact that they work well and potentially prevent serious damage, and even injury, in the case of a blowout. It is also imperative that you check the date of manufacture On the sidewall – we had a tire that looked nearly new it it let go. Fortunately it didn’t tear things apart. Hi Rob! We apologize that you have yet to received your cards. Member Services will be contacting you soon. Found the TPMS to be a real benefit. It especially is important for the inside wheels of the rear duals where you can’t visually see them. I pull an Altima, four on the ground and would not have detected it’s rear flat without the TPMS. Found installing an inexpensive signal repeater in side the coach and tiring into the closet light wiring was the answer to picking up signal to car. What make of TPMS did Steve Froese have on his unit? Which brand(s) of TPMS do you recommend? The choices are a bit overwhelming and reviews are consistently both good and bad for most.